Arriving on the pop music scene in 1997, Steps were instantly dismissed as a novelty act when they released debut single 5,6,7,8. The five-piece defied the odds by going on to rule the pop charts until they separated in 2001 when members Ian ‘H’ Watkins and Claire Richards decided to quit the group. 10 years passed before the band reunited with the awkward reunion captured for a reality series that aired on Sky Living. Putting aside their differences Steps released hits album The Ultimate Collection, which hit number 1, and embarked on a sold-out arena tour. In 2012 the group released Light Up The World, their first studio album in 11 years but it didn’t enjoy the level of success that Steps have enjoyed throughout their career. Following a tour in support of the album, Steps disappeared from the limelight again until earlier this year when they announced plans to celebrate their 20th anniversary with a brand new studio album and an arena tour. Scared of the Dark, the lead single from new album Tears on the Dancefloor, debuted to widespread acclaim and it hinted that Steps could be about to beat the odds once again by staging a massive comeback. Tears on the Dancefloor has now arrived and the excitement generated by Scared of the Dark has set expectations for the album very high. Could Steps possibly pull off one of the biggest pop comebacks since Take That? Yes they most definitely have as Tears on the Dancefloor is not only a strong album for the group, it’s possibly their best album to date AND the finest pop album so far this year. Over the course of its 10 tracks, Steps have managed to pay homage to their unique sound while modernising it to work in today’s charts. The album opens with Scared of the Dark and it never really lets up from that point onwards. The group promised that there would be no straight-up ballads on the record and they weren’t lying. Tears on the Dancefloor is strictly uptempo with shimmering beats, catchy hooks and plenty of handbag in the air moments. Four of the tracks have been recorded by other artists but to be honest that doesn’t matter one bit as Steps have put their own stamp all over them. Much has been made of the group recording Story of a Heart, written by ABBA’s Benny and Bjorn. The song fits Steps like a glove and it’s one of many glorious moments across the album. It’s always been said by fans of the group that Steps are the modern day ABBA and with this recording they add more weight to that statement. Elsewhere on the album You Make Me Whole is a proper club banger, the Darren Hayes penned No More Tears on the Dancefloor is a euphoric disco number, and Space Between Us gives H and Lee Latchford-Evans chance to take on lead vocals. One of the standout moments is the dark electro-pop of Happy, which feels like a worthy successor to Deeper Shade Of Blue as Steps’ edgiest recording to date and sees Claire, Faye Tozer and Lisa Scott-Lee trading lead vocals. The album comes to a close with a cover of Lara Fabian’s I Will Love Again, which gives Claire a chance to unleash that big voice she possesses. In Steps’ hands the song is transformed into a huge banger that could easily be a single at some point in the future. 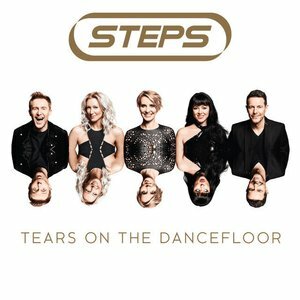 Steps don’t put a foot wrong with Tears on the Dancefloor and it’s the pop record we all need right now. Over its 10 songs, the album makes you forgot about the misery going round in the world and urges you to dance it out. Who would have thought that 20 years on, Steps would be releasing one of the best pop albums in recent memory? Even more, who would have thought they’d be battling Ed Sheeran to top the album chart? I for one am glad they’re back and long may they stick around!